Between January 2018 and January 2019, Oregon employers added 29,500 jobs. This makes Oregon the 16th fastest market for job growth with a rate of 1.5 percent - slightly better than California's 1.4 percent. Oregon's job growth rate last year was slightly slower than the overall national rate of 1.7 percent. At the same time, Nevada's job growth ranked number one with a rate of +3.9 percent. Other Pacific Northwest states outpaced Oregon - Washington was at +2.5 percent, and Idaho was at +2.4 percent. 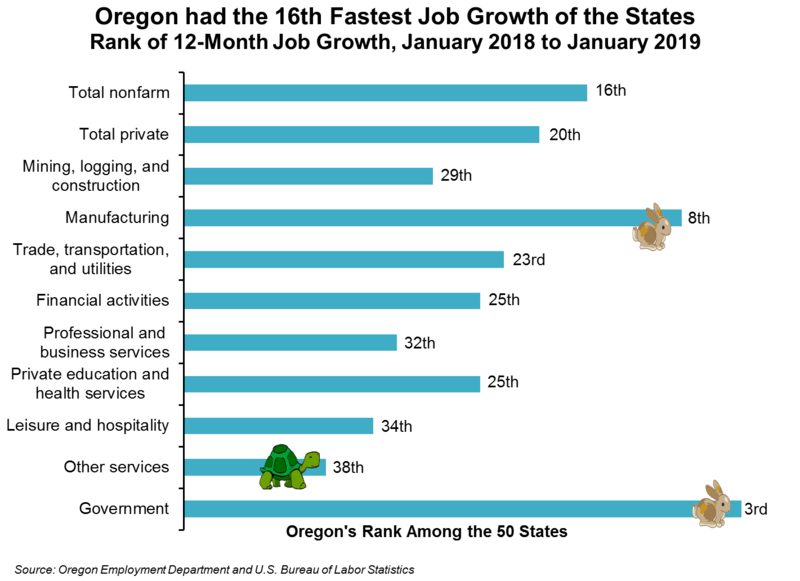 Interestingly, the two sectors of Oregon's job growth that would rank in the top 10 nationwide were government, where the state would rank 3rd, and manufacturing, where it'd rank 8th. To learn more, turn to the Current Employment Statics for the state; the University of Oregon's Tim Duy's Economic Indicators; and/or Christian Kaylor's Portland employment report.